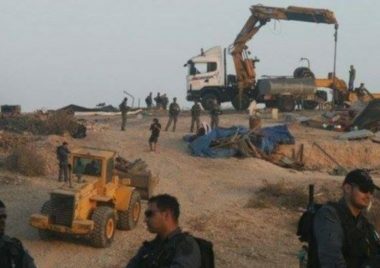 Israeli soldiers, police officers and personnel of the so-called “Negev Development Authority” invaded, Thursday, the al-Arakib Bedouin village, in the Negev, and demolished it for the 139th consecutive time. The villagers stated that dozens of soldiers and police officers invaded the community, accompanied by bulldozers, and demolished the tents, barns and sheds. They added that the officers attacked many of villagers, before forcing them out of their dwellings, despite the cold weather. The police also abducted the head of the Popular Committee in al-‘Arakib, Ahmad Khalil Abu Mdeighim, in addition to three women. They were released several hours after the soldiers demolished the village and withdrew from the area.